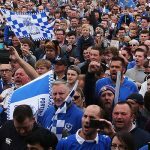 Around 50 Supporters’ Club members had the chance to meet Portsmouth Football Club Goalkeeper Luke McGee in a Question and Answer session. Here are some of the questions. Luke McGee started off by praising the defence especially the centre- halves considering the injuries we have had. Matt Clarke and Christian Burgess have been so solid and Olli Hawkins has done remarkably well playing at Centre – back. Luke stated he is loving life at Pompey and playing in front of 18,000 fans. Q) The opening question was – Luke some of your saves this season have been magic – Are you related Debbie McGee on Strictly Dancing? After the laughter stopped, Luke politely replied No. Q) What are your weakness and strengths? A) MY WEAKNESS is to improve my kicking – I have been working with John Keeley to hone all parts of my game, but especially my kicking. We have a solid plan for me where to kick the ball. As we are not the biggest side our plan is for me to kick the ball one side and for us to crowd the ball and win the 2nd ball from that. John studies every aspect of my game and Keelo has had years in the game as a player and now coach, so far he has helped me massively. Q) Was it a Penalty against Matt Clarke in the Southend game? A) No when we came in at Half Time, Matt had a ball mark on his chest. The referee we believe was unsure otherwise he would have sent Matt Clarke off for handball; it was the linesman that gave it. I enjoy facing penalties, I study penalties takers of different sides we play with Keelo and the technical staff here, guess the way to go and also give a bit of banter to the player to try and put him off. Q) Why do we drop back and defend so deep? A) I guess that’s just pressure and a natural way to defend your box. The centre backs try to read the game and drop deeper. It is not planned just the way it happens. Q) Did you start off as a youngster in goal? A) No. I was a outfield player until the age of 10, then because I was one of the Tallest players we had, I was ask to go in goal, played well, kept a few clean sheets and got offered a contract as a goalkeeper. Q) Who is the best team we have played. A) Wigan without a doubt, their benchmark in this league and it was pleasing to have had such a good game there and helping us get a draw. Q) How disappointing was the Peterborough result, and what is the difference between the two clubs? A) Very Disappointing. Peterborough as a club and there fans were very good to me and the result was so disappointing. Here at Portsmouth the expectation is a lot higher, the passion and fan base much bigger. Whether its 18,000 fans at home or 3,000 away, the fans pay decent money so its only fair we give them a football match and a win to try to match that. Peterborough wanted me back and a move was on the cards then Portsmouth came in and it was a no-brainer. I look at the history of Portsmouth the support, fan base, advice from my parents and of course Kenny Jackett was here. I worked with Kenny for about six to eight weeks at the end of last season and he impressed me and we kept in touch. It was hard leaving Tottenham I had been there since the age of 10, and was a Tottenham fan. Q) What are your long term plans? A) To win things at Portsmouth and stay here a long time, although I tend to look not to far in the future. Longer term take my coaching badges and become a goalkeeping coach. Q) Do the players take any notice of write-ups in “The News”. A) Depends on the player. Most read if you had a good game and avoid if you had a bad game. No one wants to read that they have had a bad game. Q) What is your usual weeks work? 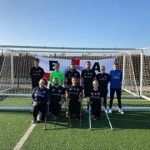 Monday – if in because sometimes we get Monday off – its light work with John Keeley, Alex Bass and the Academy goalkeepers. Tuesday – work with first team, team shape etc. Thursday – short and sharp shot stopping. Friday – work with first team, how the opposition play, our team shape etc. For the Plymouth game this weekend, It has mainly been concentrating on our strengths and doing our things right. Q) What sort of diet do you have? A) Yes I always put the right boot and right glove on first, and I put a bottle of water and towel in the same area of the goal each game. Q) What Length of Contract do you have and have you moved down yet? A) Yes I Live at Fareham and I got 2 and half years left on my contract. As I said I am enjoying life here, I don’t regret the move and have faith in my ability without being arrogant. As part of a wider general consultation process, Portsmouth FC is seeking opinions from supporters on six design concepts for a revised crest for the club. 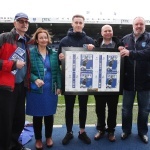 Club management have been working closely with the Board of PFC on proposed new designs, and these have already been seen by members of the Heritage & Advisory Board, Tony Goodall Fans Conference, and the Pompey History Society. To protect the club’s crest going forward it is vital that the club has the ability to copyright it, whilst still retaining the essence of the existing design and the heritage that this encompasses. The club would like to invite feedback from supporters on each of the six designs. This feedback will be presented to the club’s heritage and advisory board, which will then recommend a final version for Board approval. The consultation will close on Tuesday November 14 at midnight.